Evolutionary biologist Michael Shapiro and his team from the University of Utah made international headlines in 2013 when they found that a prominent change in pigeon plumage, head crests, could be traced to a mutation in a single gene. Now, in the new advanced online edition of Molecular Biology and Evolution, the research team has found an almost exact repeat in the evolutionary playbook. A mutation in the same gene, EphB2, has led to a similar result in domesticated ringneck doves. The mutation causes the feathers on the back of the head and neck to grow up toward the head in a striking look. Domesticated rock pigeons have more than 300 varieties that have been bred and chosen for their prized looks and vibrant feather colors. The head crested birds had one version of the gene, a single mutation that made an aberrant protein (Arg758Cys) responsible for the feather difference between them and uncrested birds. The researchers performed DNA analyses from 50 crested and 75 uncrested ringneck doves and found a different mutation in the same gene, which led to a single Gly636Arg amino acid substitution. In both cases, a single DNA base change hinders normal protein function by changing an amino acid at a crucial spot, causing the feather to swoop up towards the head rather than tuck neatly down. "Crested birds from both species have mutations in the same gene, and even in the same functional part of the gene," said Shapiro. "This suggests that only a limited number of genes - perhaps only genes in the EphB2 pathway - can cause crest formation without causing other problems that affect survival of the embryo or adult. Studying other species will help us understand if this same genetic mechanism is used repeatedly throughout crested bird species, or if it's a mechanism that's limited to the pigeon and dove family." 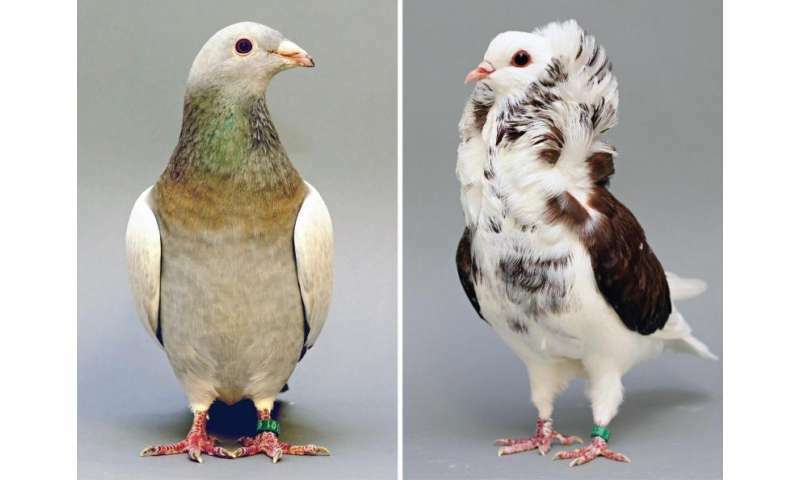 Domestic ringneck doves and pigeons have head crests that are associated with different mutations in the EphB2 gene. Top row: uncrested (left) and "peak" crested (right) forms of the ringneck dove. 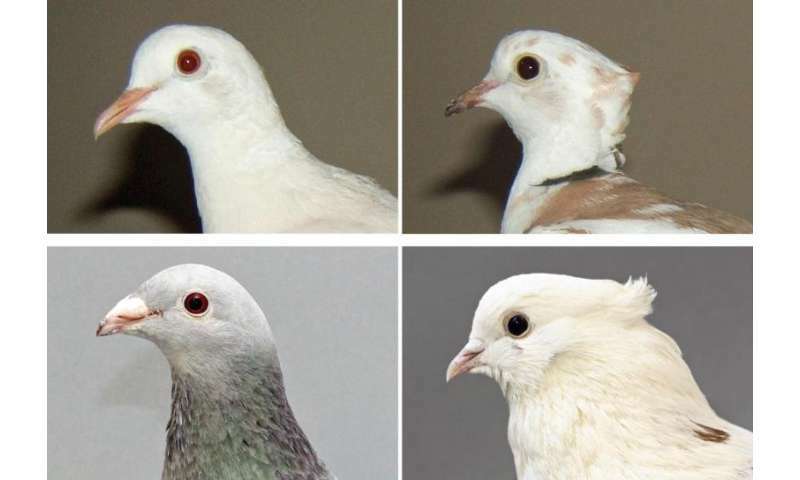 Bottom row: uncrested racing homer (left) and 'peak' crested Indian fantail (right) domestic pigeons. The peak crest is the only type of crest found in ringneck doves and is the simplest form of the crest in pigeons. Credit: Klaudia Kis (ringneck doves) and Sydney Stringham (pigeons). Given that the ringneck dove is a domesticated species that last shared a common ancestor with the rock pigeon 23-35 million years ago, the study shows that the same gene can be implicated as a prime driver of feather variation in completely different species, separated over a great evolutionary distance. "We know that many genes are involved in feather development, so it's rather remarkable that the same gene appears to control the same trait in two distantly related species," said Shapiro. Next, armed with new DNA banks of bird species, Shapiro's team will examine how far and wide this unique evolutionary twist may be found amongst other bird species and wild populations.